For better and for worse, the trends in external trade observed in the first two months have been strengthened in the third month of this year. The import statistics have been for the better, while the export statistics continued to be unfavourable. The first quarter’s trade outturn though hopeful, is fragile and vulnerable. Prudent fiscal and monetary management are vital to contain the trade deficit. In the first quarter of the year, the trade deficit has been reduced by 23.4 per cent compared to that of the first quarter of last year with imports declining by 16 per cent. However export performance continues to be disappointing with export earnings declining by 8 per cent with industrial and agricultural exports declining. The trade deficit of US$ 2.12 billion in the first quarter when annualised is about US$ 8.5 billion. This is still high and may result in only a small balance of payments surplus. A much lower trade deficit is needed to achieve a balance of payments surplus to meet foreign debt servicing obligations. It is important that policy makers are vigilant to ensure that there are no increases in imports that upset the apple cart. It is noteworthy that the decrease in imports in the first quarter was achieved by all three categories of imports decreasing: Consumer imports by 19.4 per cent, intermediate imports by 16.7 per cent and investment goods by 11.6 per cent. It is essential that this trend of declining imports continue, especially as export earnings are continuing to fall. 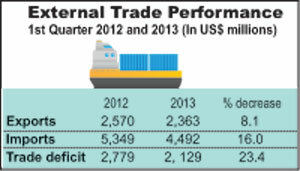 It would be important to curtail imports further to contain the trade deficit to less than US$ 8 billion this year. Consumer imports have declined since the policy changes in early 2012. The depreciation of the currency, increased tariffs on many consumer goods, most notably cars, food items such as dhal, sugar, milk and potatoes, brought down the import expenditure on consumer imports. The reduction in intermediate goods imports was, however, tardy owing to oil imports that constituted 26 per cent of total imports last year being difficult to contain despite a price hike. Nevertheless, intermediate goods imports declined by 16.7 per cent in the first quarter. However, there are concerns that this may be reversed owing to larger imports and higher prices of vital intermediate imports like oil and fertiliser. The international prices of oil are volatile and difficult to predict, though there have been decreases in oil prices to below US$ 100 per barrel recently. If oil prices decrease in the coming months, it would greatly ease the costs of intermediate imports. The drop in textile imports has been due to lower needs of decreasing garment export industry. Investment goods imports continued to rise last year as these were mainly due to the large public expenditure on infrastructure development. This expenditure had high import content as transport equipment and building materials had to be imported. Therefore the reduction of investment goods imports by 11.6 per cent in the first quarter of this year is especially significant. There appears to have been a slow down on infrastructure development that has enabled a reduction in investment goods imports. It is therefore vital for the government to recognise the need for curtailing public investment programmes that have large import content. There must be a continuing restraint on public expenditure to ensure that this trend is not reversed. Otherwise the gains in the first quarter could be undone. If the trade deficit continues in the manner of the first quarter then the trade deficit would be around US$ 8.4 billion. This is likely to result in a balance of payments (BOP) surplus of about US$ 1-2 billion, depending on the performance of exports as well. Bringing down the trade deficit to below US$ 8 billion should be a policy objective. There are several apprehensions that the trade deficit may not be contained in the remaining months of the year. The easing of monetary policy could increase private consumption that would lead to higher imports. There are rumblings that tariffs on car imports may be brought down in order to enhance revenues from import duties. Remedying the revenue shortfall by increasing imports is a cure worse than the disease. Another concern is that expenditure on imports for the Commonwealth Heads of Government Meeting (CHOGM) in November may result in heavy spending with a high import component. If intermediate and investment goods imports rise due to this reason then the trade gap is likely to surpass the US$ 8 billion mark. The disappointing feature of the trade balance is the continuing decline in exports. Export earnings fell 8 per cent to US$ 1.7 billion in the first quarter compared to US$ 1.9 in the same period last year. There is little prospect of much improvement on exports owing to the persistent slow global economic growth, especially in western countries that matter for our exports; the unrest in the Middle East tea markets; and the Iranian trade embargo. As in past years, workers’ remittances, tourism and other earnings from services and net capital inflows are expected to offset a high proportion of the trade deficit. With a trade deficit of around US$ 8 billion these are expected to wipe out the entire trade deficit to result in a balance of payments surplus. The inflows of workers’ remittances amounted to US$ 1.56 billion during the first quarter of 2013 — an increase of 3.4 per cent over the corresponding period in 2012. However, the decline in workers’ remittances by 3.4 per cent in March 2013, to US$ 545 million compared to US dollars 565 million in March 2012 is a mild concern. Hopefully this is not an indication of a decline in remittances in the coming months. Workers’ remittances are likely to exceed US$ 6 billion and offset about 75 per cent of a trade deficit of US$ 8 billion. Earnings from tourism increased by 19.1 per cent compared to the first quarter of 2012 and may reach US$ 1.5 billion. Inflows of capital, either as foreign direct investment or portfolio investments, are less optimistic and more uncertain. Nevertheless these three items should offset a trade deficit of around US$ 8 billion. This scenario underscores the need for a deficit of less than US$ 8 billion to generate an adequate balance of payments surplus to meet foreign debt servicing obligations estimated at about US$ 1.5 billion. There should be every effort to use monetary and fiscal policy to restrain imports and enhance exports. There has been a noteworthy improvement in the trade balance in the first quarter of the year owing to a significant decline in all categories of imports. It is important for this trend to continue to narrow the trade gap to less than US$ 8 billion. Since there is not much expectation of an increase in exports this year, it is vital that import expenditure is contained to below US$ 8 billion, to avert the diminishing of foreign reserves and increasing the foreign debt burden.